Gets nowhere near the ball. 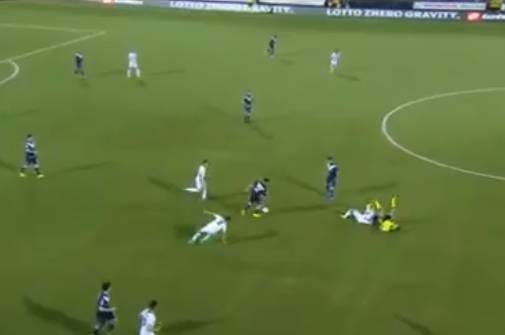 Tuesday night at the Orogel Stadium – Dino Manuzzi in northern Italy saw an AC Cesena player slide tackle the referee as Brescia visited for a Serie B game. In a hotly-contested match, official Riccardo Pinzani was taken out by Luca Garritano who careered into a slide tackle and seemed to be unable to alter its direction. Sailing quite wide of the ball, Cesena’s Garritano clatters into the ref, knocking him clean off his feet. To their credit, the pair quickly manage to get up and carry on. A 1-1 draw leaves both teams hovering just above the division’s relegation play-off places.